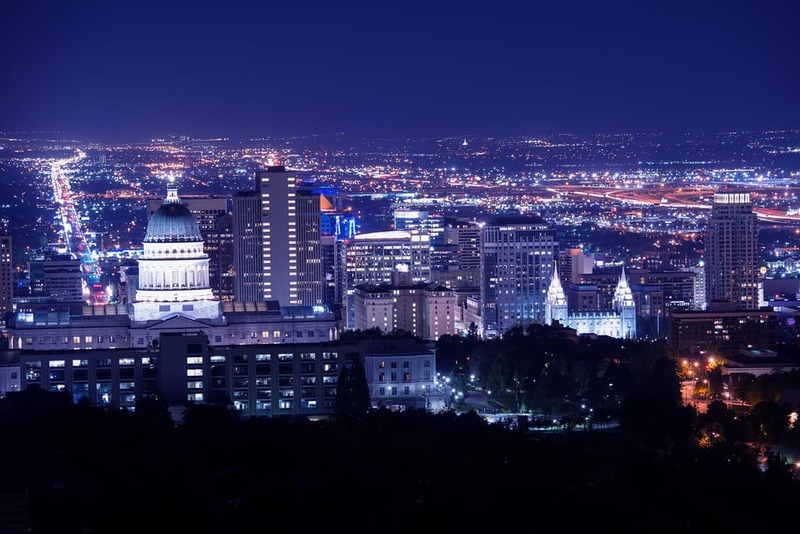 Are you exhibiting at a trade show in Salt Lake City? Do you need assistance creating a spectacular trade show display? Metro Exhibits can help. We provide purchase trade show displays, rental trade show exhibits and much more to satisfy all of your exhibiting needs in Salt Lake City, Utah. Salt Lake City, often shortened to Salt Lake or SLC, is the capital and the most populated municipality of the U.S. state of Utah. It’s one of only two major urban areas in the Great Basin. Salt Lake City has a strongly developed outdoor recreation tourist industry based primarily on skiing, and hosted the 2002 Winter Olympics. Salt Lake the industrial banking center of the United States. The climate is commonly claimed to be semi-arid, but under the Köppen climate classification, Salt Lake City has a hot-summer humid continental climate with hot summers and cold, snowy winters. Local, state and federal governments have a large presence in the city employment. Trade transportation and utilities also take up a significant portion of employment, with major employers being Delta hub at Salt Lake City International Airport. Other major employers include the university of Utah, Sinclair Oil Corporation, and The Church of Jesus Christ of Latter-day Saints. Located within Salt Lake City is the premier trade show and convention center named the Salt Palace Convention Center. This convention center holds up to 700,000 square feet of exhibit space and 3 floors. This location also holds large scale show annually such as the Jamberry Annual Conference. Young Living Essential Oils Convention, Jamberry Annual Conference, Hearing Loss Association of America Conference, NACAA Annual Meeting, Association for Creative Industries Trade Show, USANA Annual Convention, FireFan Convention. At Metro Exhibits we understand the needs of companies and organizations to stand above all others. Branding, the practice of building a lifelong preference amongst consumers to choose and patronize your company, is of crucial importance. At trade shows exhibits and conventions in Salt Lake City, Utah the ability to make an impression that will separate you from your competition is our goal. Metro Exhibits provides the best physical representation of your brand possible. In Salt Lake City, as in other cities around the United States, we offer a full complement of trade show and convention services. We will work with you to create and design unique trade show and exposition booths, displays, and corporate spaces. Contact Metro Exhibits us to learn more about Salt Lake City trade show rentals, sales and other trade show support services. Located within Salt Lake City is the premier trade show and convention center named the Salt Palace Convention Center. This convention center holds up to 700,000 square feet of exhibit space and 3 floors. Additionally, the facility includes 10 exhibit halls for a variety of options for shows, and conferences. The facility is also located within walking distance of major transportation and 15 minutes from the airport. For more information look here. The South Towne Expo Center is the second largest expo center in Salt Lake City. This facility has over 243,000 square feet of exhibit space and five different halls for multiple options. The location also offers 15,000 square feet of meeting rooms idea for trade shows and conventions. Finally, the location offers 1,700 outdoor parking spaces and easy access to the TRAX light rail station. For more information look here. School Nutrition Association of Utah Summer Conference, Jam On It Rocky Mountain Showcase, Salt Lake Gaming Con, Agnes & Dora Conference, Perfectly Posh Convention, Yoli Annual Convention. Snowbird Resort & Conference Center, Gallivan Center, Double Tree Suits. Contact us today to review your needs for trade show display purchase or trade show exhibit rentals for your next trade show in Salt Lake City, UT.